Facilities for the physically disabled. But they must not be allowed misbehave in public for monetary gains. Of course the disabled deserve sympathies and whatever help that can be extended. However, it does not give them the right to misbehave, break the law or even extort the public. He said the blind man’s act could be classified as “extortion”? What say you lawyers and the police? 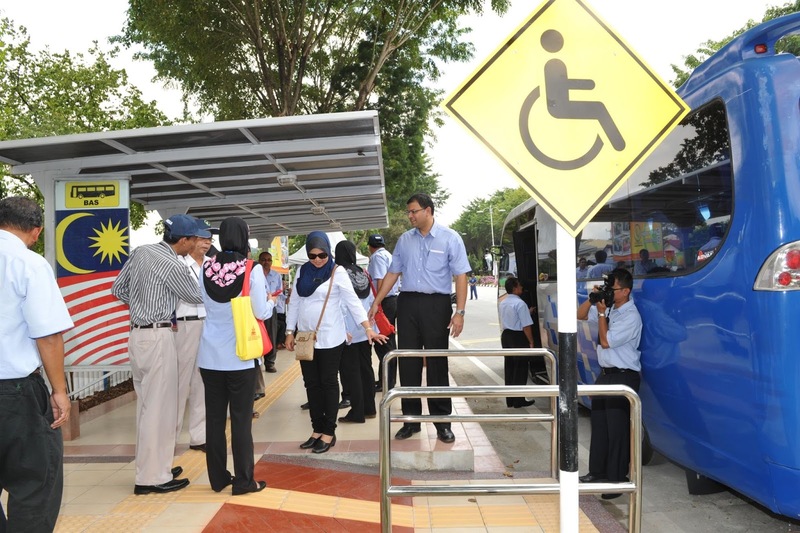 Syed Razak asked: “What is going to happen to society should those with physical disabilities start behaving like the blind man? “Although the young man in the video was obviously full of sympathy and courteous, and he tried to help resolve the ‘traffic standstill’, it is certainly not right. “Giving in to the demands of the blind man is encouraging him to continue to behave the way he did. The police should have been called in to resolve the problem. “The blind man also seriously needs counselling to correct his behaviour and attitude,” he added. Syed Razak, who is Gerakan’s nominee to contest N.37 Bukit Lanjan in the coming 14th General Election (GE14), said those with physical disabilities cannot be allowed to “take advantage of public sympathies” or “be treated differently by the law”. “A crime is a crime, no matter who has committed it. Demanding money to stop the nuisance is akin to extortion,” he added. “The blind man is obviously unreasonable, creating a nuisance of himself in public and ‘extorting’ money,” Syed Razak said, at a risk of being labelled “heartless”. “The issue is not about being heartless to the disabled. It is about public behaviour and the law,” he added. PETALING JAYA: An elderly blind man forced traffic along a Bangsar street to come to a standstill on Wednesday afternoon and refused to budge unless he was given RM20. In a video recorded by radio presenter Matthew Ong, which has now gone viral, the man is seen standing in the middle of the street on Jalan Telawi 4, with a line of cars in front of him. Ong said he first noticed the man when a passer-by attempted to help him but he still did not move. "Thinking it was a language issue, I went up to him to help, but then I realised that he wasn't clueless. "He knew exactly what he was doing and wouldn't budge unless I gave him some money," he wrote in a Facebook post. Ong said he handed the man RM1, but the man still refused to move off the road. "He took the cash and then continued standing there after berating me that it wasn't enough. He wanted RM10 or RM20. That's when I took this video," he said. In the video, Ong can be heard telling the man in Hokkien that he is holding up traffic and verbally offers him RM5. However, the man refuses to accept and replies "don't make me angry or I will hit you". The camera then pans to a car blocked by the elderly man. The driver, who appears frustrated, hands RM10 to Ong to pass to the man to get him to move away. The man accepts the money and slowly ambles off to the side of the road, allowing traffic to pass. The video has been viewed more than 150,000 times, received 2,000 shares and has garnered comments from the public who claimed to have encountered the same man with the same modus operandi. They say he has been spotted in various areas such as Desa Sri Hartamas, Kota Damansara, Mont Kiara and USJ Subang Jaya. "Seen him in Hartamas before too. He was standing at the roadside calling for help to bring him across. I did. But after that, he asked me to buy his magazine. I said I'll pass," posted Facebook user Candy Han. "Then he rudely asked me, are you working here or are you just a poor student? He then scolded me saying I was heartless for not buying from a blind uncle. Speechless," said Han. Yaacob Khan, another Facebook user, said he had encountered the man in Kota Damansara and Mont Kiara. "He yells tolong (help) to the point where his voice breaks ... either he asks for money or a ride elsewhere " he said, adding that he was taking advantage of the kindness of others."